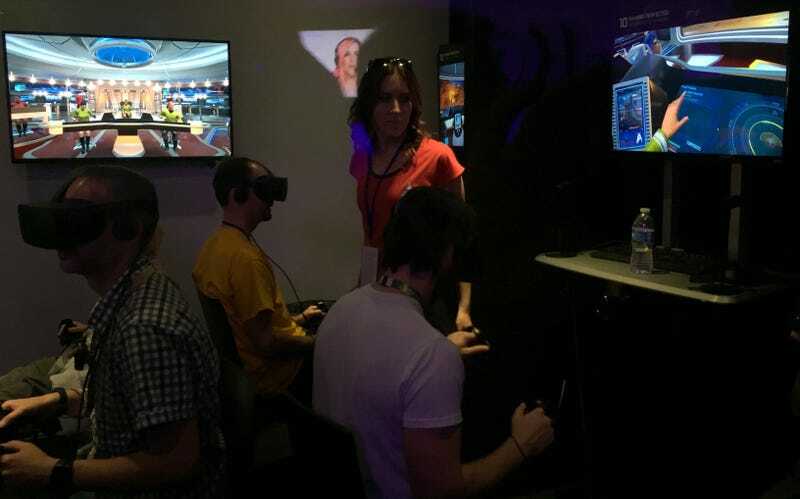 There’s a window in one of the corners of Ubisoft’s massive E3 booth, and through it you can see people playing the new Star Trek Bridge Crew virtual reality game. We couldn’t play the game ourselves, but watching others through glass was a sufficient back-up option. The lady in red is overseeing the demo and isn’t playing. The four people seated are playing. They’re all wearing Oculus Rift headsets and wielding Oculus Touch controllers in each hand (the game is also slated for the Vive and PlayStation VR. Those hand controllers are tracked by a camera and allow the movements of the in-game characters to follow those of the players in real life. The man in the checked shirt is at the helm and is steering the ship. To his right is an engineer, who you can’t see. The guy in yellow is the captain. He seems to be able to look outside the ship and identify points of interest. The guy in the white shirt is on tactical. He handles weapons. In the shot above, notice how he is reaching with his left hand. The monitor above shows what he can see. You can see his character’s hand reaching forward. If you look at the monitor in the top left of the picture, you’ll see the avatars for all four players. Our tactical guy is the woman in green seated at the console. Note that her left hand is reaching forward. We’ve got four characters, all being puppeteered by VR gamers. Pretty cool. The demo that these folks were playing seemed short. They flew around, engaged a Klingon ship, and won the battle. Presumably there’s more to it than that, but even this basic experience that you can see through Ubisoft’s window looks pretty cool.